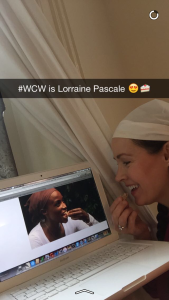 If you have been following along on this Woman Crush Wednesday journey you know that it is truly my favorite aspect of this blog. The news/media is burning up at the moment on the topic of gender imbalance in the work place. In fact a dear friend of mine actually runs a media research center on this topic. So that is why I adore giving the lady chefs their deserved limelight. And today’s recipient will blow you and your baking pans away! She is beyond an amazing chef, this renaissance woman is straight up an amazing human being! I could actually write an entire week’s worth of blog posts about her! I mean look at that HAPPY face of hers!!! I love it! 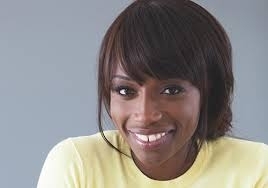 Former Sport’s Illustrated Swimsuit Supermodel Lorraine Pascale has this magnetic megawatt smile and at first glance one might think, aw lucky her she’s had a charmed life. But when you delve into her past, which she has openly shared, you will see that it hasn’t been a bed of fondant roses. Given up for adoption as a baby, she spent years in foster care, but has somehow maintained an upbeat outlook on life. 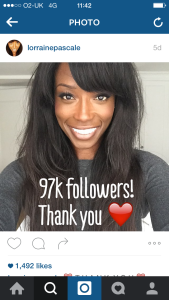 One peek at her social media such as Instagram and you’ll find all sorts of positive quotes and inspirational messages for her followers. To top that off, she is always thanking them for their support. That doesn’t go unnoticed on the internet world where many famous folks don’t like to engage at all with their audience. With fabulous sales of her cookery books and successful television shows that followed, she is now on to American television. Lorraine is one of the judges on Holiday Baking Championship for the Food Network. Though she sits along side Ace of Cakes’ Duff Goldman she is on a throne all to herself in my mind. She emanates love and forgiveness and positivity. She has gone beyond the modeling and the foodie world and worked hard to bring awareness to the issues involved with adoption and fostering in a BBC documentary. Not only are Lorraine and I both single moms who were born in November (though I might be a bit older than she, haha) she also spent some time in Santa Monica, my former hometown. But the biggest aspect that draws me to her is this; she, like me, found solace from her chaotic world through cooking and baking. We also share a great appetite for food, therefore a necessity to work out! Hey, I think it’s great to get a good sweat, then you can have a good sweet! No guilt treat! 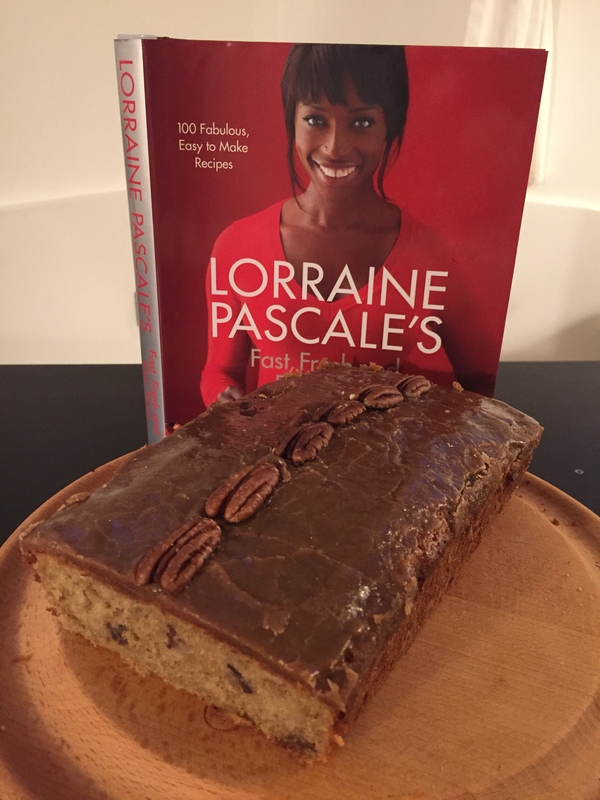 However, Lorraine is a super motivator and has blog posts detailing ways to maintain “stick- to -it-tiveness” for a healthy routine. Speaking of healthy, I decided of all her recipes to give her banana bread recipe a go. 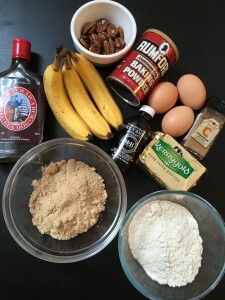 I know that there are three times as many banana bread recipes out there in the foodie world as there are ovens to bake them. But I really love this recipe as Lorraine incorporates a surprise element not seen in other versions. Maybe it is a nod to her birth mother who is of Jamaican roots. I for one am glad that her mum decided to give birth to this angel Lorraine. I would imagine it must be hard on these moms to give their children up for adoption. But like Steve Jobs and John Lennon who were both adopted, the world is a better place because of their existence! Preheat oven to 170C/325 F/Gas mark 3. Line a 22 x 10cm loaf tin with baking paper making sure to overlap top of tin and brush with oil then set aside. Cream together the butter and sugar until light and fluffy and pale. Add the vanilla extract and one egg and beat well. Add the flour, salt, baking powder, cinnamon and rest of the eggs and beat well, then stir in the bananas and pecans. Pour into the loaf tin and bake for 55- 60 mins until a skewer inserted into the middle of the cake comes out clean. Meanwhile make the Rum Sugar Syrup by mixing the rum and sugar in a pan over high heat. Boil furiously until it begins to get thicker (about 5 mins) then set aside. 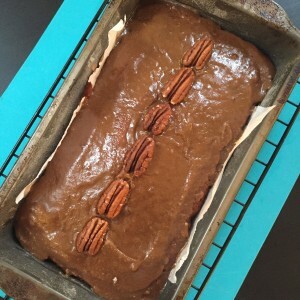 Once the cake has cooked, remove from the oven and pour lots of rum sugar syrup over the top. Sprinkle with a some of the extra toasted pecans. This moist banana loaf is beyond delicious!! That Rum Sugar Syrup on top is a lovely surprise that takes this to a whole other level. What’s not a surprise is that I am bananas about Lorraine! She is a cool and chic chef, a magnificent mom, a terrific tv presenter, and an awesome and inspiring individual! 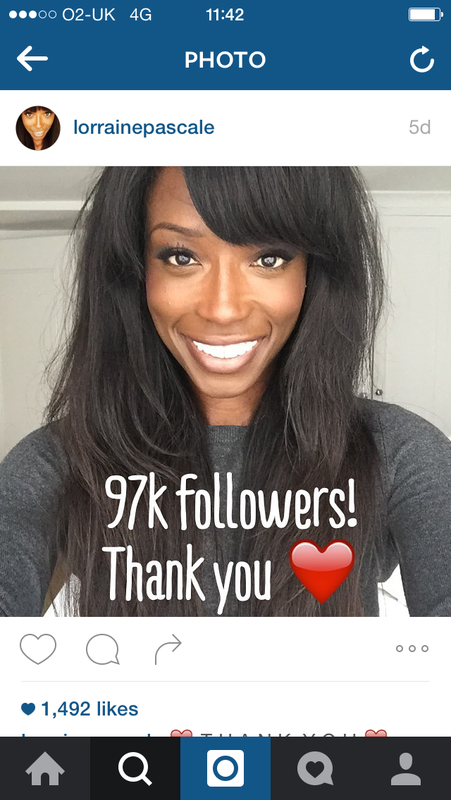 Your day will seriously get sunnier if you bake one of her treats, follow her on instagram or simply read her story. And her Youtube channel is choc o block with video tutorials. I love this one on making crusted avocado nibbles! With massive love and tons of props to you Lovely Lorraine! P.S. 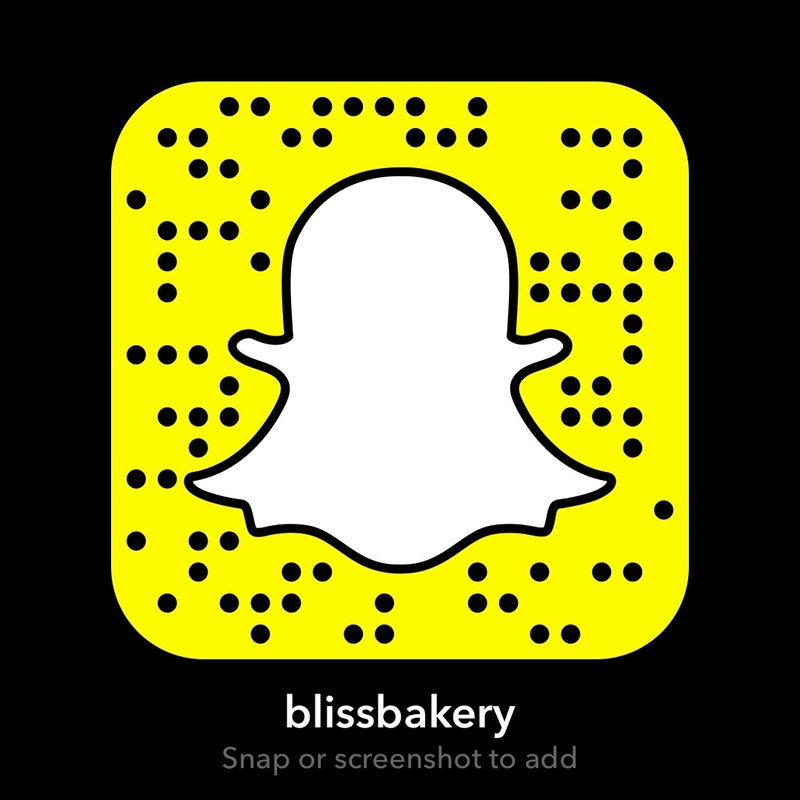 the 24 hour love fest on snapchat (user name; blissbakery) may be temporary, but the adulation will continue a lifetime for this awesome lady! Next > Recipe: 3 Weeks until Thanksgiving Guys!